Overall fit was good, torso-length, etc, and the fabric is lovely. However, while the ruffled looks adorable in photos, on me it looked more like a subdued clown suit. 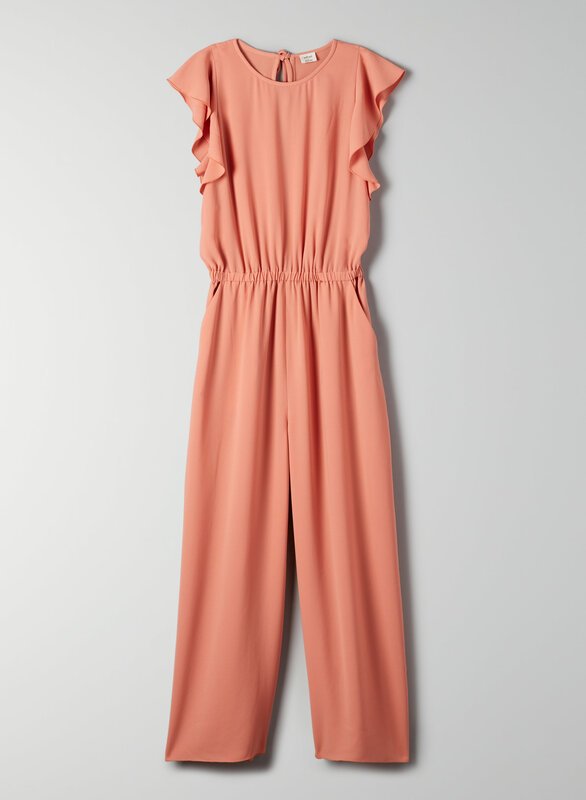 This jumpsuit falls beautifully, is very flattering, and can serve multiple functions (dress up, dress down). But the fabric had an air of cheapness. 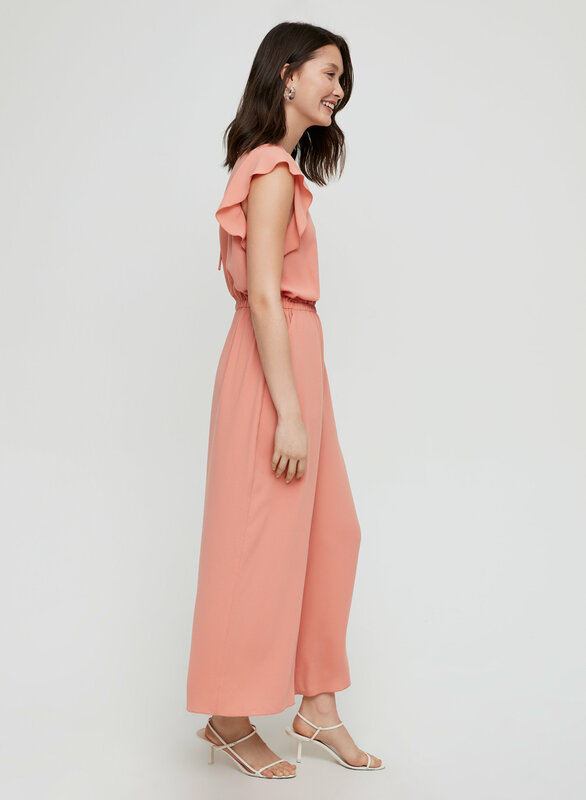 I would 100% purchase this jumpsuit in cotton, linen, or even silk. If you’re looking for something that will look really nice and flattering, and don’t care much about the material, this is for you. Easy to wear and dress up or dress down. Get compliments every single time I wear it. This was very pretty but I found it was too sheer (I bought the light pink colour). Also think it would have been nicer if the front waistband was a solid band instead of elastic - have the elastic waist in the back only. So pretty! Easy to wear day or night! I own it in 3 colours! I am about 5'4 so I will need to have it altered but it is beautiful. I got the rose quartz colour, it is slightly darker than what I saw on my computer screen, where it almost looked white. 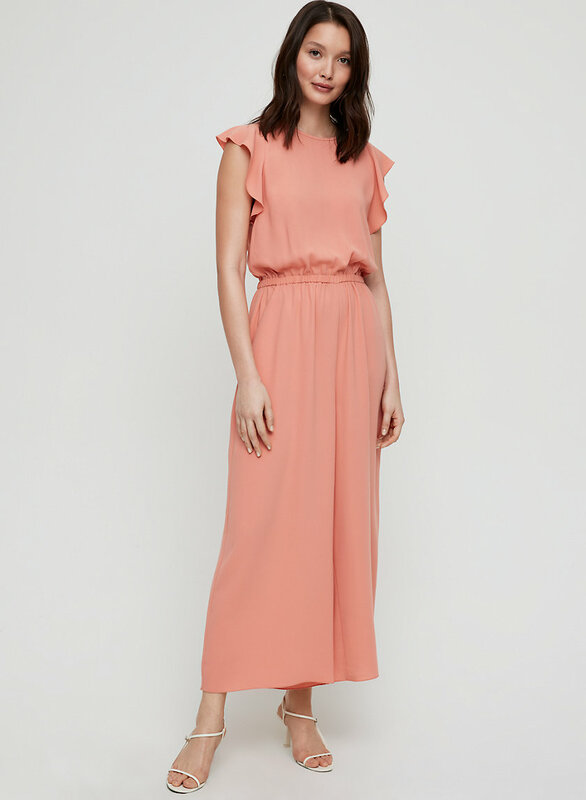 I am so excited to be in this awesome jumpsuit for my cousin's wedding party. This jumpsuit is everything! I bought it for NYE and it didn’t disappoint. The fabric is luxurious, you can feel the quality! The fit is perfect and very flattering. I feel amazing in this! Absolutely love this jumpsuit! Wore it to a rehearsal dinner and received a ton of compliments. The grey color is perfect. I am 5’6” and 128lbs and the small fit perfectly - I wanted it to be a bit loose and flowy.